You can use a StackPanel to make its child elements the same size in one of its dimensions. This is harder to do in the other dimension. 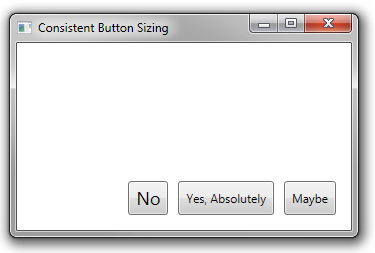 The example below uses a StackPanel to contain some buttons. They end up the same height, but are still different widths. You can make the buttons the same height and width using a UniformGrid instead of a StackPanel. <UniformGrid DockPanel.Dock="Bottom" Margin="10" Rows="1" HorizontalAlignment="Right"
The UniformGrid will make sure that each cell is the same height and the same width. 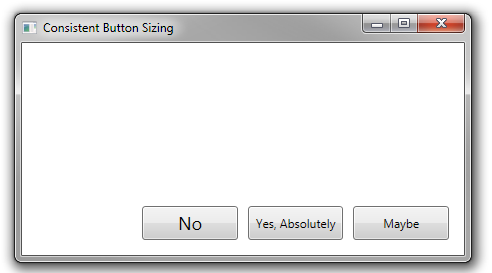 This is desirable because you then avoid having to set the button sizes manually.